Coffee is a social drink, whether you are ordering an expresso from a crowded bar in Naples or sipping coffee from a saucer in Sweden, as Marcus Samuelsson's grandfather did. 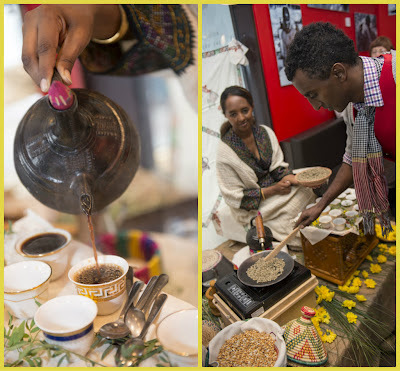 But the coffee ceremony from Ethiopia, the birthplace of coffee is something very moving. I got to experience it over the weekend, at an event hosted by Ethiopian born Chef Marcus Samuelsson and illy that was held at Espressamente, the illy cafe in San Francisco. 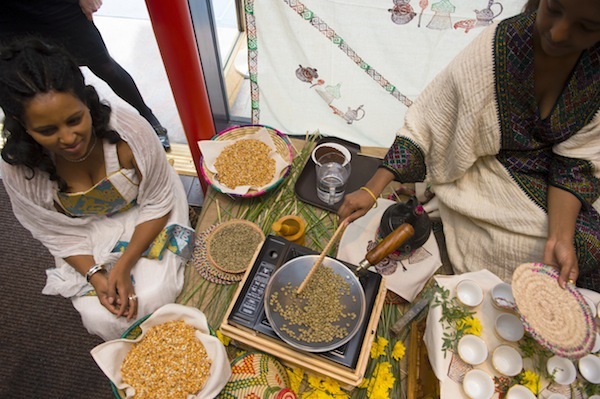 The coffee ritual occurs when you entertain guests at home in Ethiopia. Marcus Samuelsson explained it's a way of getting together, of celebrating. What I experienced was a form of hospitality that truly envelops all your senses. The coffee is prepared by a woman, sitting on the ground, but fresh flowers and greenery are used to beautify the space. Green coffee beans are roasted, and at first there is only the scent of incense used to begin the ceremony but slowly as the beans toast in a pan over the course of 40 minutes to an hour, the aroma becomes stronger and stronger. The scent is intoxicating! It fills the space and if coffee is invigorating, the aroma is somehow relaxing and soothing. After just 8 minutes the beans begin to pop. When roasted, the beans are transferred to a basket and allowed to cool. Deciding when the beans are ready to grind is crucial. The basket is ingenious, it folds up and forms a funnel to slip the beans into a mortar and pestle where the beans are ground by hand. The grinds are boiled with water in a a jebena, a type of burnished clay pot. The coffee is served in small cups and we drink it black, in some parts of Ethiopia they might add salt or butter. The coffee is fragrant with floral and citrus notes and Samuelsson tells me later that Ethiopian coffee such as illly's MonoArabica blend from Ethiopia is best served this way without anything to detract from it's delicacy. The hints of jasmine and lavender are heady. Served with the coffee is a mixture of toasted grains and seeds, in this case crunchy barley and sunflower seeds that accent the toasty, nutty flavors of the coffee. It's an ancient ritual but everyone in the room is enchanted by it and the gracious East Bay based Ethiopian women who guide us through it. To experience some Ethiopian hospitality, please visit Brundo for coffee and spices and Cafe Colucci for a wide variety of Ethiopian food. My thanks to illy for inviting me to experience the Ethiopian coffee ceremony. Please note, while I worked with illy during SF Chefs, this is not a sponsored post.